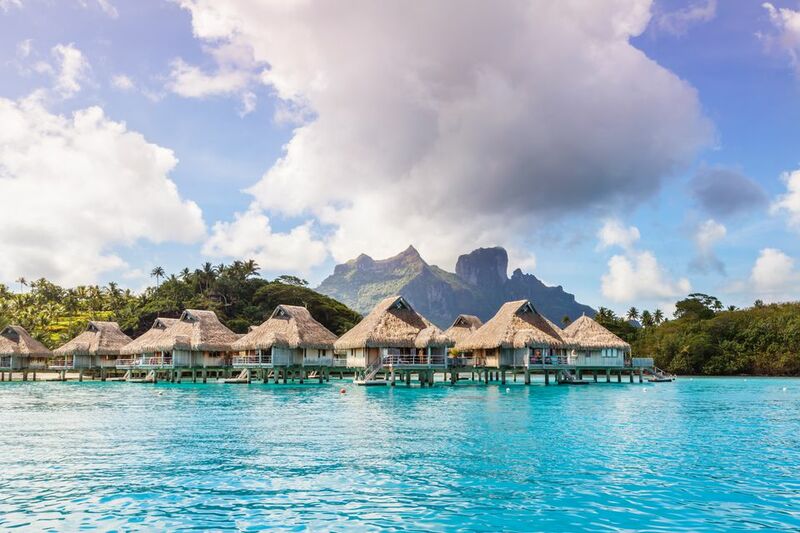 The Tahitian paradise of Bora Bora is the perfect place to do nothing - but it also offers plenty of activities for adventure-seekers and honeymooners looking for an adrenaline rush or a truly romantic memory. From sublime snorkeling to fiery flame twirling and up-close shark feeding, here are eight ways to experience the island in all its Technicolor glory. Don a life jacket, make sure your sunglasses are secure, turn the throttle and then zoom and zip over the lagoon as it changes color from pale turquoise to deep sapphire. On the two-hour adventure with Matira Jet Tours you'll ogle Mt. Otemanu from every angle, wave to other travelers sunning on the decks of their overwater bungalows, and stop for a refreshing swim and fresh-picked snack at a private beach. Yes, you are in the water with them, but no, you are not their lunch! Be more than a mere spectator during this thrilling Bora Bora excursion (bookable at most resorts) as you don mask and snorkel and float in the shallow, sand-bottomed lagoon as your guide welcomes three-foot-wide southern stingrays and three-to-four-foot black-tip reef sharks to snack on the raw fish he's handing out. The sharks tend to keep their distance and circle, but a few of the stingrays are gentle and playful enough to touch. While there are plenty of traditional hip-shaking dance performances on Bora Bora, the most memorable evening entertainment is high-speed flame twirling by a troupe of traditional Tahitian fire dancers. Dressed in loincloths, these pyrotechnic experts dazzle with acrobatic antics employing flames so hot you'll feel the heat from 10 feet away. Inquire about a performance at your resort, but the best shows we've seen are at the InterContinental Bora Bora Resort & Thalasso Spa and the Four Seasons Resort Bora Bora. There's so much vivid blue in Bora Bora, that it seems almost an illusion when the lagoon takes on soothing silver and magenta hues as the sun fades into a magical and prolonged dusk. This is the most romantic time to be out on the lagoon and several resorts offer sunset cruises, complete with cocktails and appetizers. If you're staying at the Four Seasons Resort Bora Bora, its new catamaran, the Navigator, heads out each Sunday for a 90-minute cruise featuring champagne and sushi. It's called "pearl fever" and many a visitor, after seeing locals wearing the luminous black pearls cultivated in Tahiti's crystal-clear lagoons, suffers from it, feeling an overwhelming desire to own some themselves. Bora Bora's main town, Vaitape, has at least a ​half dozen upscale pearl shops, including OPEC, Tahia Collins, and Robert Wan, while a crafts market, selling less precious jewelry made from mother of pearl and smaller black pearls, can satisfy those with a more limited budget. There's really no need for a snorkel excursion in Bora Bora since it's possible to spy on vibrant reef fish-angelfish, parrotfish, needlefish and even the occasional black-tip reef shark-right from your overwater bungalow. Your resort will provide a mask, snorkel, and fins and you can take a scenic dip à deux whenever you'd like. Throw a bit of bread into the water and you'll have plenty of company! Of course, where there's coral, there's also more fish, so if you really love to snorkel, inquire about a three-hour and 30-minute trip with Reef Discovery to the Coral Garden and the Aquarium. It's just the two of you, your server, the shimmering lagoon and the silhouette of Mt. Otemanu as you sip champagne and dine on a fabulous multi-course Polynesian-inspired meal. Almost every resort on Bora Bora offers a private beach dinner-and costs vary from about $300-$500, but if you are celebrating something special (your wedding, your engagement, your anniversary), dining alone together beneath the stars is a gastronomic feast you'll long remember. Tahitian ink is the stuff of legend-literally. The word "tattoo" is derived from the Tahitian word tatou. Detailed body decoration in Bora Bora and the other islands dates back centuries. Today, visitors can be safely tattooed with ancient tribal designs using modern equipment at the Manea Spa at the Bora Bora Pearl Beach Resort & Spa, where artist Jean-Yves "Matatiki" Tamarii will give you a lasting memory of this beautiful island.